In some cases, it may make sense to create a new Profile based on an existing one, as an existing Profile may be quite well suited to a new task but require changes to certain settings within its own workflow (such as different resolutions, color spaces and many other options). The same principle also applies to Checks and Fixups. The starting point can be one of the Profiles supplied as standard or a custom one with specific details that need to be altered. 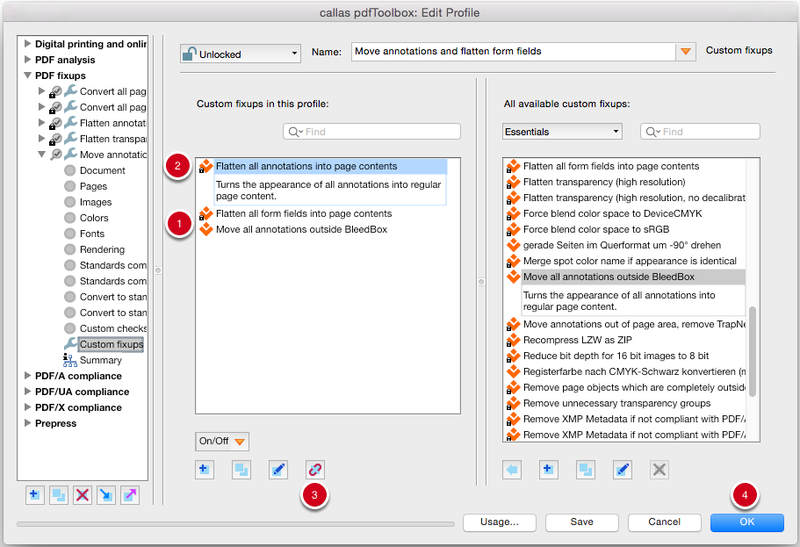 The user can duplicate the existing Profile and alter specific elements as necessary. We’ll show you how this works step by step. 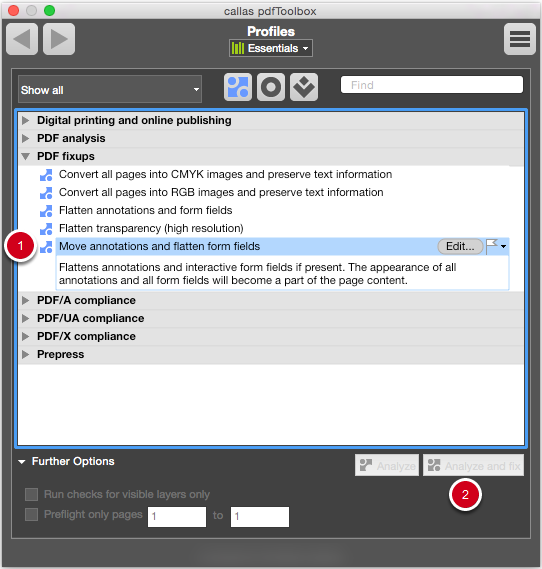 pdfaPilot distinguishes between Profiles, Checks and Fixups. Checks and Fixups are edited in a broadly similar fashion to one another. Profiles are edited and set up in a different way, as from a technical perspective they (may) combine both Checks and Fixups. We will therefore first show you how duplicates of Checks and Fixups can be used. In a later section, we will then demonstrate how the process applies to Profiles. 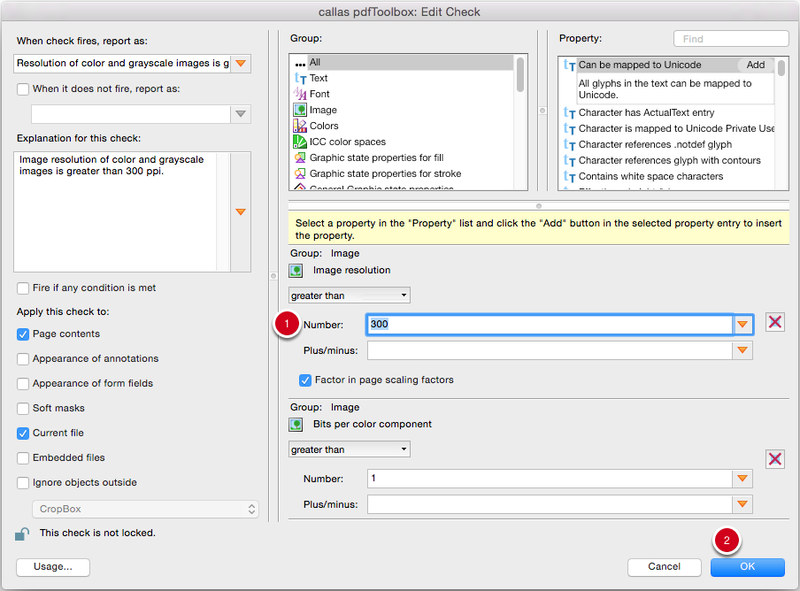 Checks and Fixups are set up in a similar way in pdfaPilot. In the example shown, the Check “Resolution of color and grayscale images is greater than 250 ppi” needs to be changed, raising the threshold to 300 ppi. 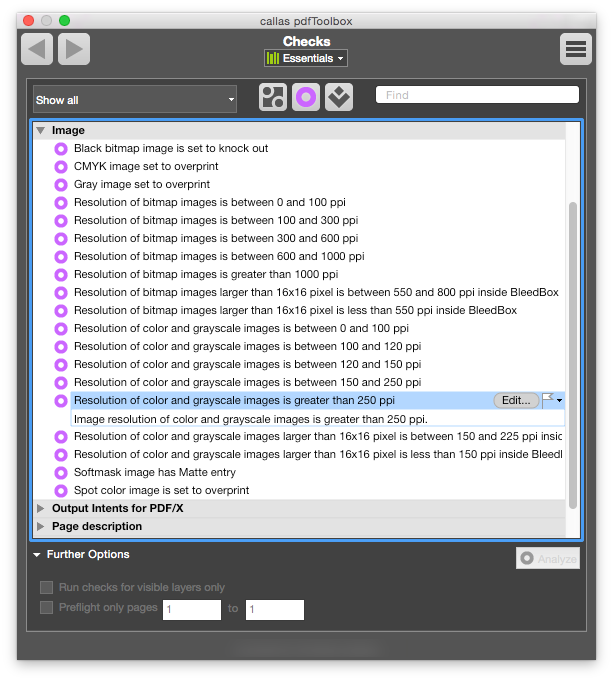 The Check can be found under the “Image” category and is a part of the “Essentials” library. 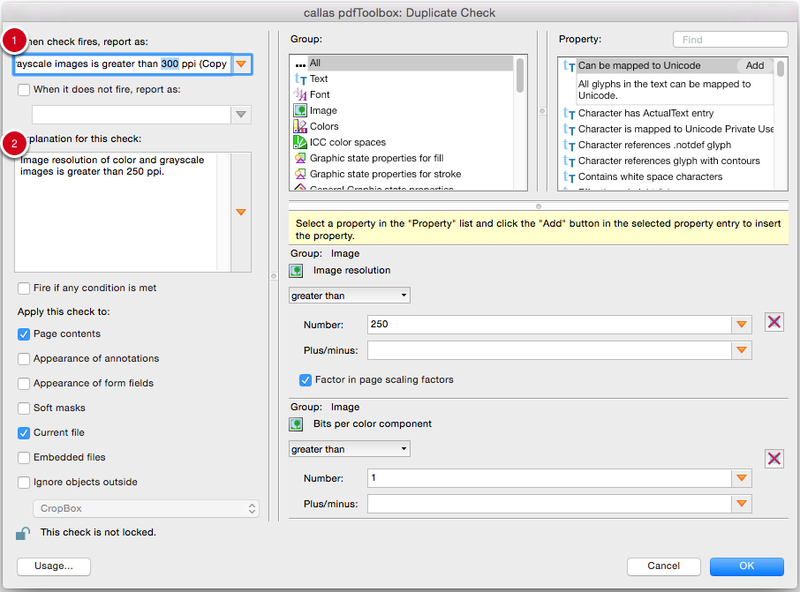 To duplicate a Check, Fixup or Profile, first select it. 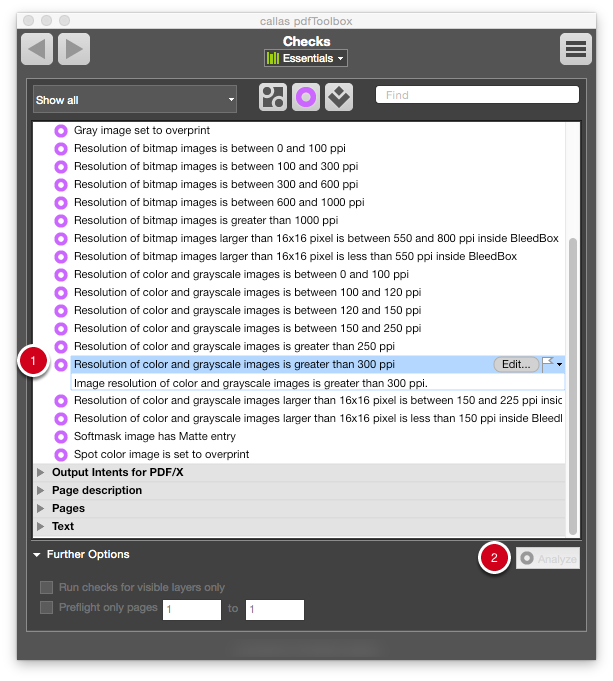 In the flyout menu to the upper right (1), select “Duplicate Check (or Fixup)” (2). First, we should change the description of the Check so that its new function is clear. In the example shown, the automatically generated text “Resolution of color and grayscale images is greater than 250 ppi (Copy 1)” can be changed to “Resolution of color and grayscale images is greater than 300 ppi” in the corresponding field (1). We should also update the text in the Explanation field (2). The property that needs to be changed in this example can be found under the “Image” group. The image resolution for the duplicate is now raised from 250 to 300 (1). Click on the OK button (2) to save your changes. The new Profile is now shown in the list of Checks (1). 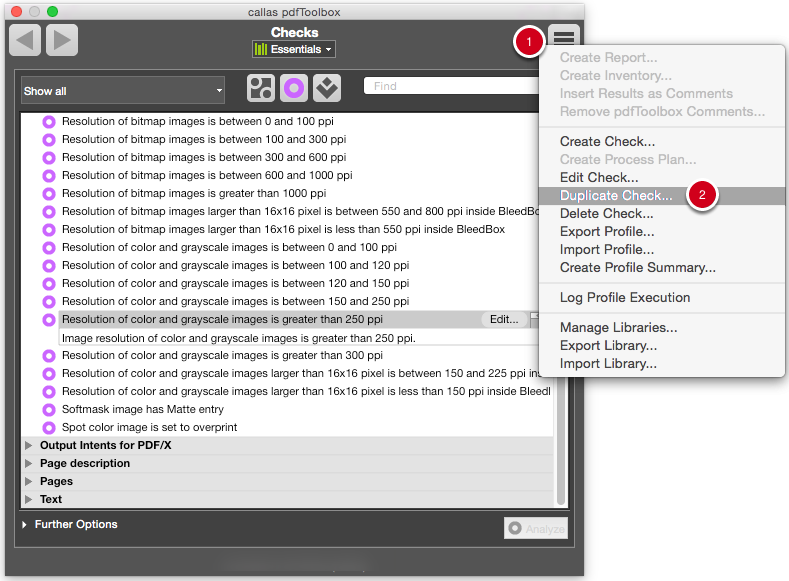 Click on Analyze (2) to find and report any applicable images in a PDF document with a resolution greater than 300 ppi. In this section, we’ll show you how to set up Profiles. Profiles consist of a combination of Checks and Fixups. 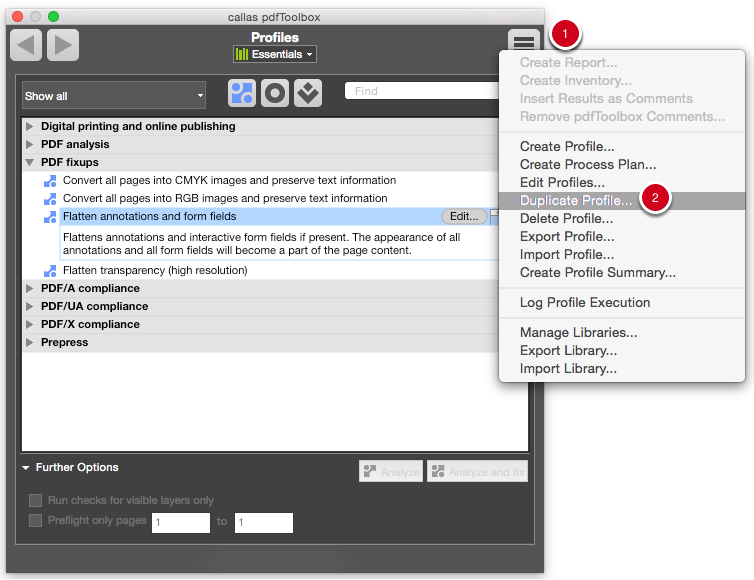 In the example shown, the Profile “Flatten annotations and form fields” needs to be altered. The new Profile should only flatten form fields and move annotations out of the BleedBox. 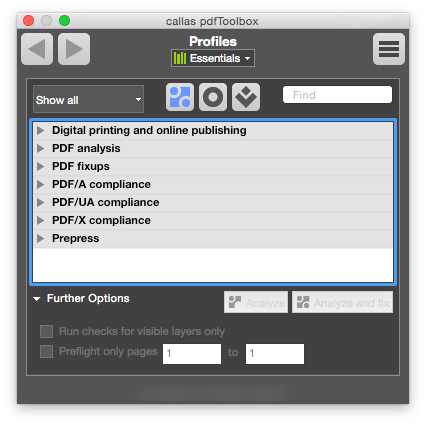 The Profile can be found in the “PDF Fixups” category and is a part of the “Essentials” library. To duplicate a Profile, first select it. 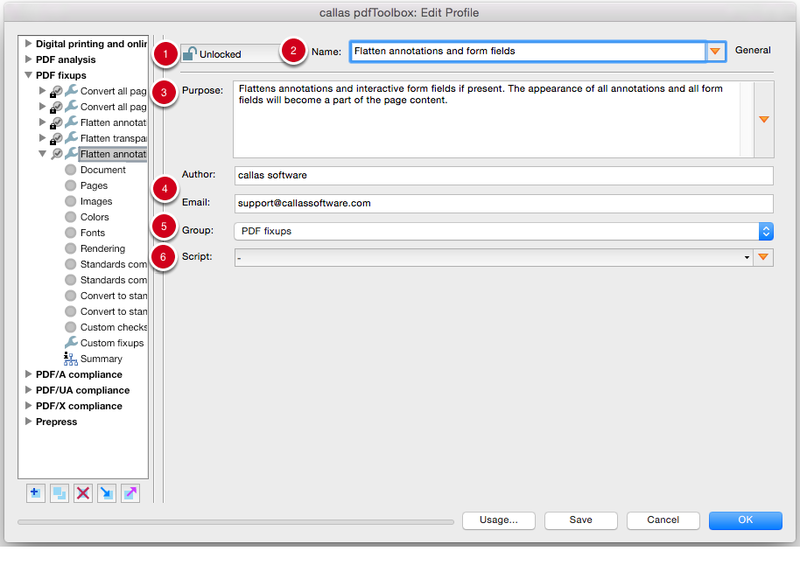 In the flyout menu to the upper right (1), select “Duplicate Profile” (2). The user can protect the Profile from being changed by clicking on the lock symbol. We should change the name of the Profile so that its new function is clear. 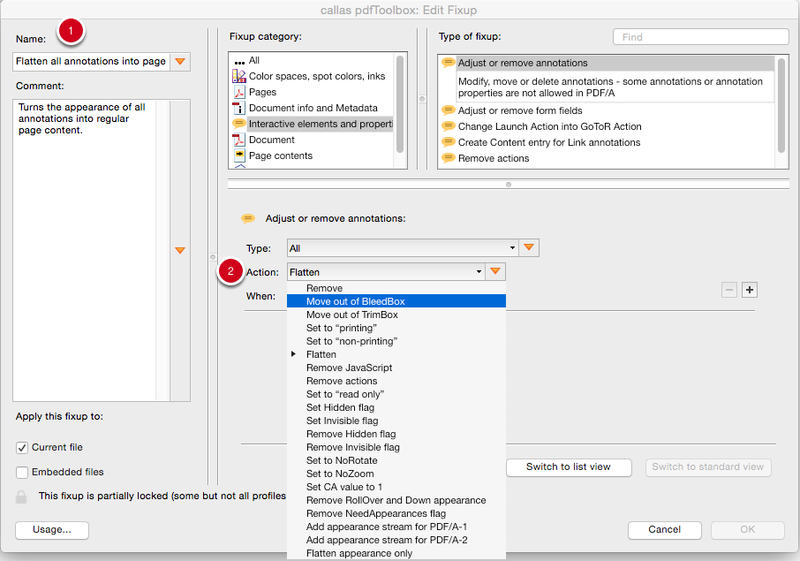 In the example shown, the automatically generated text “Flatten annotations and form fields (Copy)” can be changed to “Move annotations and flatten form fields” in the relevant box. We should also update the text in the Comment field. Provide your own details in the Author and Email fields. 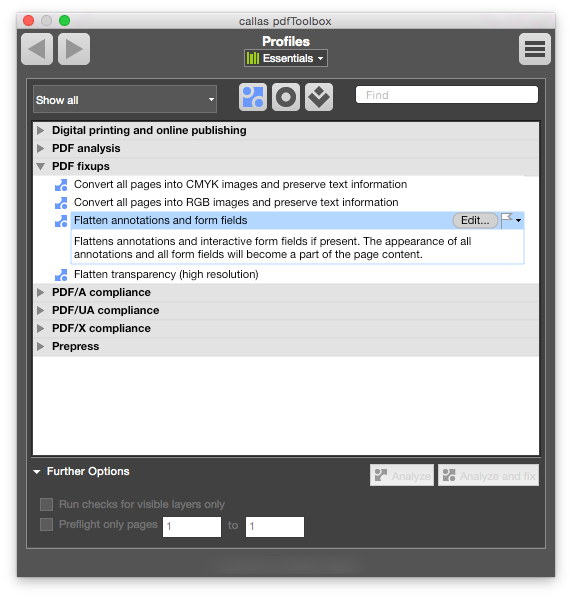 As this Profile is a duplicate, the “PDF Fixups” group is still suitable. No script is used for this Profile. We will then duplicate the Fixup by clicking on the duplicate symbol. For this new duplicated Fixup, we should again edit the name and comment in the left column. The new Profile should move annotations instead of flattening them. We therefore select the appropriate entry from the pull-down menu under “Action”. The new Fixup is now listed in the middle column. The previous Fixup must now be removed. To do so, select the corresponding item in the list. To remove it, click on the broken link symbol to break the link between the selected Fixup and the Profile. Click OK to save and close the altered Profile. The new Profile is now shown in the list of Profiles (1). 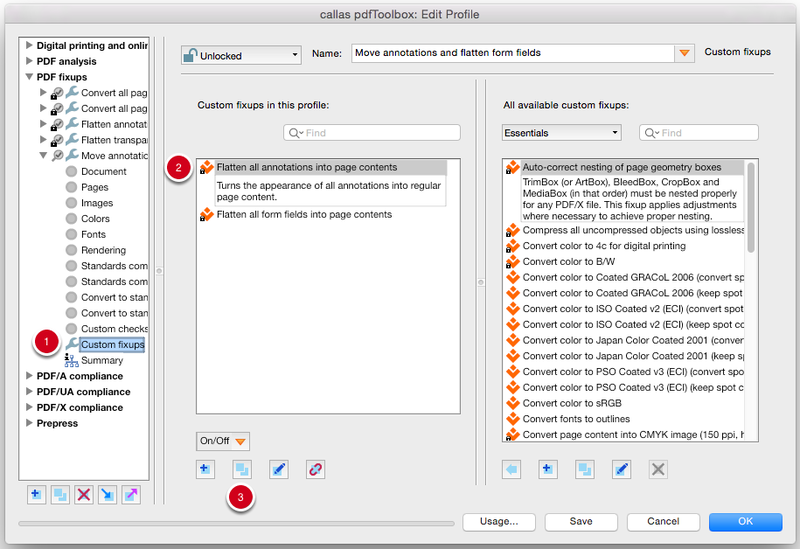 Click Analyze and fix (2) to execute the Profile.